What a run of madness that was. In the end, those who like upsets may have been a little saddened that the number 1 seed overall won the whole thing. But they didn’t have an easy run of it. They trailed by more than 10 in both the semi-final and final. They had to deal with one of their teammates going down to what I’ve heard many say is “the worst injury I’ve seen in sports”. 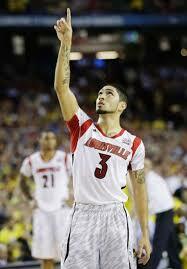 Siva's play is "all for Jesus"
from USA today, Siva had a very difficult home life growing up. The most well shared part of his story is the day, at age 13, when he took his brother’s car and drove around to various seedy parts of Seattle looking for his drug addict father. You can read this Sports Spectrum article about Siva’s deep rooted faith in God and spiritual leadership for the team. He plays by the motto “Its All Jesus”. 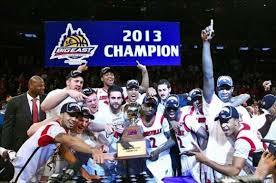 Now, as one of the best players on the championship team, it isn’t surprising that he and the rest of the Cardinals were able to overcome the injury to Kevin Ware. So why does an injury like that happen? Who knows? But some cool things that have come out because of it. If you watched the game last night, then you know that Cardinals Luke Hancock was instrumental in Louisville’s comeback. He was rewarded with the MVP award). They were down by a dozen when he started going on a rampage of 3 pointers that keyed a 14-1 run right before halftime. But it was Hancock’s actions during the injury to Ware that really amazed me and challenged me. As you can hear in interviews and read in this blog by Cory Nikkel (warning: He links to the injury video not for the faint of heart), Hancock quickly made his way over to his fallen teammate, put a hand on his chest and prayed for Ware. Check out the picture from USA today. Hancock says he was moved to be by Ware’s side because he had suffered an injury last summer and remembered his teammate that came and stayed by his side – that meant a lot to him, so he knew he had to be that guy for his injured teammate. I have 3 thoughts to share about this story. 1- Serving God and Loving others can get messy and uncomfortable. Others instincts was to turn away, to cringe and even to throw up. I am not condemning the natural reaction – it is natural! But Hancock opted to go into the place of pain and suffering and be with the one dealing with the pain. We are called to that, too. To meet people in need where they are, and to be there to comfort and pray for each other. 2- Our desire to help others is motivated by our own experiences. Hancock felt compelled to go over to Ware because he remembered how much he didn’t want to be alone when he was injured. God wants to use the experiences we have in our lives – positive and negative – to help others. 3- When in doubt – Pray. No one had seen anything like this before. No one really knew what to do, how to help. Prayer can go a long way in those situations. We are told to pray continuously and as we listen to the Holy Spirit, we will be helped with what to pray for. Very cool that all these things from this team pointed to God. 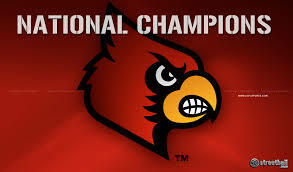 Congrats to Louisville for their Championship run!